Abby Hayes of St. Scholastica Academy in Covington is one of the 17 winners of the George Rodrigue Foundation's 2019 art contest. 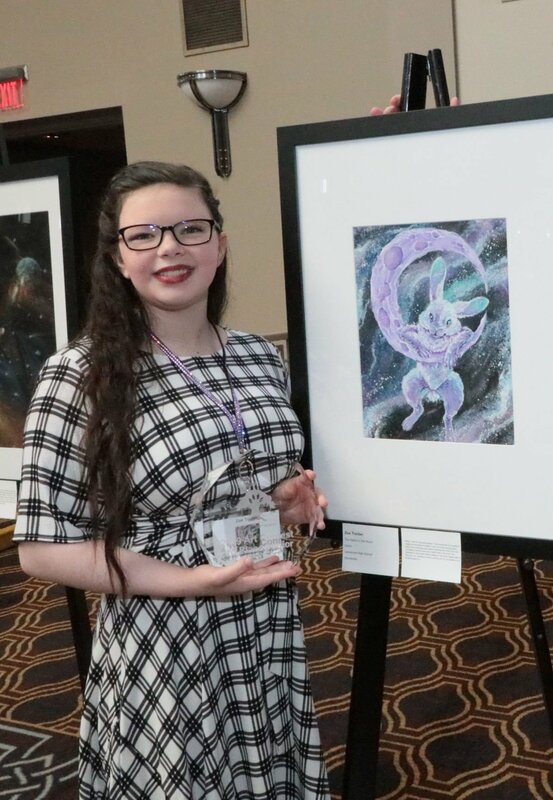 Zoe Treitler of Lakeshore High School in Mandeville is one of the 17 winners of the George Rodrigue Foundation's 2019 art contest. GEORGE RODRIGUE FOUNDATION: Juniors Abby Hayes, of St. Scholastica Academy in Covington, and Zoe Treitler, of Lakeshore High School in Mandeville, are among the 17 winners of the George Rodrigue Foundation's 2019 art contest, who will share $46,500 in college scholarships. My-Nhi Nguyen, a senior at Thomas Jefferson High School for Advanced Studies in Gretna, is also a winner. The first-place prize — which includes a $6,000 college scholarship — was awarded to high school senior Lauren Diaz, of Christian Life Academy in Baton Rouge. The 17 winning entries will travel for one year as an exhibition at museums and cultural venues across Louisiana. HAWK-A-PALOOZA FEST: Archibishop Hannan High School will hold its annual fair May 3-4, at the school at 71324 La. 1077, Covington. The rides, games, food and live music begin at 6 p.m. May 3 and at noon May 4. The event closes at 10 p.m. each night. Wristbands are for sale in advance at www.hannanhigh.org. PUPIL PROGRESSION PLAN: St. Tammany Parish Public School System officials will hold a meeting at 6 p.m. May 8 in the library at Lakeshore High School, 26301 La. 1088, Mandeville, for residents to discuss proposed changes to the School System Pupil Progression Plan. The plan establishes placement, promotion, retention and grading policies for students. Following the public input meeting, the proposed plan will be presented to the School Board for its consideration in July. A middle school band camp June 17-21 for students in grades five through nine. Tuition is $225. A guitar workshop June 10-14. Tuition is $170. A chamber music workshop June 10-14. Tuition is $170. A strings orchestra workshop June 10-14, suitable for first- to third-year violin, viola and cello students. Tuition is $125. A choir workshop June 10-14. Tuition is $170. Private instrumental and vocal lessons from June 10 to July 25. Individual lesson fees vary according to the instructor’s qualifications. For more information on any of these programs, go to www.southeastern.edu/smc or call (985) 549-5502.